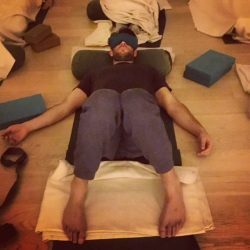 Restorative Yoga is the radical, counter-cultural practice of…being. Sounds simple, to just be… but this is a state and experience our age and culture does not lend itself to. Nor are most of us familiar with it, and nowadays a constant state of doing is drilled in from pre-school. In the practice of Restorative Yoga, we unplug literally from the external world and outside distractions and create a fully supported body, with props and very specific postures. Guidance is given on breath and thoughts and mind, moving towards a state of simply being. In that state, we feel free. 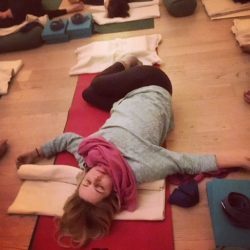 This class has multi purposes and will support you on any given day to: recharge your batteries, find peace, relax body and mind, and reconnect to yourself. Restorative Yoga has also been shown to help manage and even heal physical conditions as well as psychological and emotional imbalances. 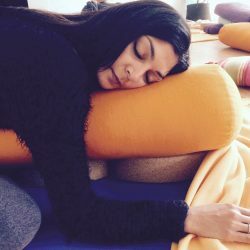 I love Restorative Yoga for many reasons, one of them being it gives me a ‘go to place’ to truly, genuinely, unplug and feel free for a while.